Once you have planned what kind of saltwater aquarium you want and purchased everything needed to put it together, follow these 10 steps to get your new marine aquarium running in a safe, orderly fashion. Get the aquarium ready. This is the first installation step. Get it into position: Put the stand into place and level it. Be sure to leave clearance for electrical connections and equipment. Clean the tank: Use fresh water and a soft cloth or sponge. Add tank backing: You can paint the tank back a color you like or apply a piece of manufactured vinyl aquarium background covering. Install the sump: If you have elected to use a sump, install it and the sump-related equipment in the cabinet/stand. Quite often it is easier to insert the sump into the stand through the top than it is through the cabinet doors. If you have not found a sump yet, a cheap, easy DIY sump might work. Install the top off system: If you are going to install a DIY automatic top off system, do it before you install your sump (it is much easier than waiting until the sump is in the cabinet). Place the tank on the stand: If needed, use an under-pad for cushioning underneath and check to see that the tank is level. In this step, you will install the sump and its associated equipment and plumbing under the aquarium. If you follow the steps, one by one, the sump equipment installation will go together quite quickly. If you are not using a sump, skip this step. In the photo above, you can see where a valve was installed in the return pump hose. This allows you to adjust the water flow to and from the sump. If your system does not have a sump, you can move on to installing all of the tank-related equipment. At this point, you can delay installing your aquarium lighting system as it will just be in the way when you are installing the sea salts, substrate, and tank decorations. Prep the filter: Remove the filter pads, rinse them in fresh water, then put them back in the filter before installing it on the back wall of the aquarium. This is a good time to check the clearance between the back of the tank and the wall. You will be removing the entire filter in the future for cleaning, so make sure that there is an extra inch or two of clearance. Install the powerheads. Hang your powerheads in the approximate position that you will have them at the completion of assembly. The positions will no doubt change once your live rock and decorations are installed in the tank. Before you put in sea salts, live rock or animals, or substrate, you should run a system wet test. Taking the time to do this allows you to make sure that all the connections and equipment are in proper working order. Most wet tests use fresh water. You do not want to install any living sand or creatures at this point, fresh water from the wet test can kill both. If you are going to be using a protein skimmer, there will be no waste produced, but you can check for bubble production and test out the pump that will be used to run it. Simulate a power outage by turning off the entire system at the power strip/timer. If you are using a sump, make sure that it does not overflow as the sump pump stops pumping and tank water is siphoned back into the sump. If the sump starts to overflow, turn the pump back on and remove some of the water from the sump. Restart the system and retest it. One method to prevent siphoning tank water back into the sump is to drill a small hole in the sump pump return pipe above the tank water line in the tank. In the event of a power outage (and whenever the return pump is turned off) the small hole will allow the siphon to be broken. Choosing the right substrate for your tank before installing it is important, if for no other reason than it is difficult to remove once the tank is up and running. Also, do the research ahead of time and determine the best sea salt for your particular aquarium. Once the system has been checked for leaks, shut the system down and remove a few gallons of water from the tank and sump. Next, add your sea salts. If you are using a sump, pour the sea salts into the sump and turn on the sump return pump. This will circulate water over the sea salts and help them to dissolve more quickly. If you don't have a sump, turn on any powerheads in the tank, along with your filter. As the sea salts dissolve, keep adding more and test the salinity frequently until the desired level is reached. If you are using live sand, pour it into the tank. The water will become cloudy, but it should clear up once you have turned on your filtration system. If you are using non-live sand, rinse it in fresh water to remove the smaller particles, then pour it into the tank. If you have live rock cured and ready for use, or if you are not going to use live rock at all, you can skip to aquascaping, which is laying out the plants, rock, stones and other decor for the tank. If you have not yet purchased live rock and are going to put some in your aquarium, now is the time to buy it and prepare it for use. You can fully cure live rock in a separate curing setup, you can cycle the aquarium with live rock, or opt to bypass the rock curing process altogether and put the live rock directly into the aquarium and start aquascaping. If you skip the curing process, it is highly recommended that you preclean the rocks before placing them into the aquarium. However, the best-case scenario is to preclean the rocks and place them into the aquarium and allow the rocks to fully cure or at least give it a few days of curing time before you aquascape the tank. Turn on all of your pumps, filters, and the protein skimmer (if you are using one). The water should start to clear as the filters remove the particulate matter in the tank water. Quite often, you may see a fine, almost dust-like layer on top of the live rocks and substrate. This is the fine particles of the substrate which have settled to the bottom before they could be filtered out. You can stir them up with a net handle or your hand to put them back into the suspension, which should enable the filters to take them out. The water should be clear by the next day, at which point you can begin to introduce your critters to the tank. While your tank water is clearing, it is a good time to install your saltwater aquarium lighting system. The lighting requirements for a fish-only tank are fairly flexible. The day and night periods can be adjusted to suit your lifestyle but make sure you give tank critters at least eight hours of darkness so they can sleep. Light timers are a good investment as they will turn the lights on and off at a predetermined time every day. If you plan to add corals to your tank at some point, you will probably want to invest in reef tank lighting when you set up your tank. 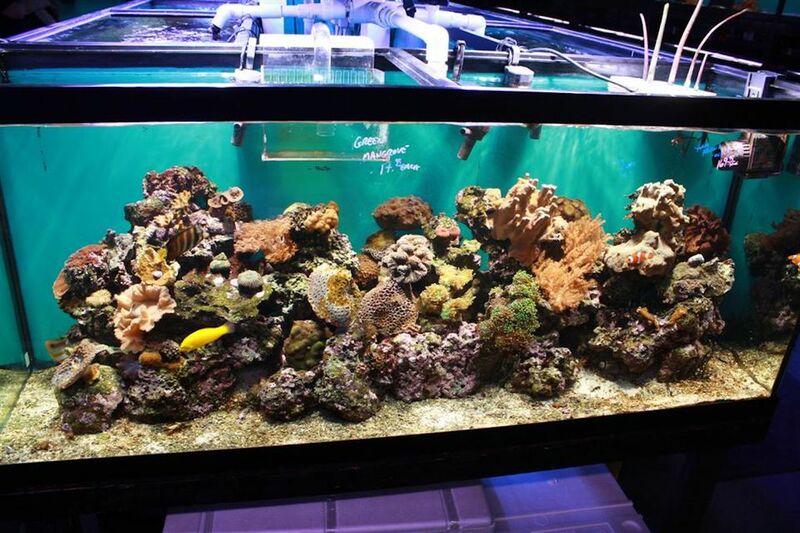 Reef tank lighting requirements are much higher than fish-only tanks since corals need a specific light period as well as a specific light spectrum. Mount your lighting fixture either on top of the tank or inside the hood and plug it into the light timer. Set the electronic or mechanical trippers in the timer for the appropriate times. Turn the lights on and marvel at your tank just before you add your fish. Once the tank water has cleared, you can start adding your livestock. It is highly recommended that you do not rush this process. It takes time for a good biological filter base to populate with beneficial bacteria. So, how many fish to begin with? It depends a lot on a few factors: How big is your tank and how healthy is your biological filter? If you have a seasoned tank with a biologically established filter then the rule of thumb is one inch of fish per five gallons of water. If you are starting with a brand new tank, then start with one or two small fish in a 55-gallon tank. This will supply the food (ammonia) needed to start the bacteria multiplying and populating your filter. Consider one or two terrific beginner fish to help you get started. Look at the saltwater aquarium fish compatibility chart to see how your fish choices are going to get along in your tank. If you are going to use a good nitrifying bacteria tank starter (highly recommended) to help with the cycling process, one or two small fish should present no problems in your new tank. Follow the directions on the package as to how much to use. It is usually recommended that, if you are using a protein skimmer, you turn it off during the initial cycling period. This will help the bacteria spread in your biological filter. Add a few hermit crabs or snails when you start your new tank. They will help to keep the inevitable waste and algae under control. When you add each new fish or invertebrate, make sure that you take your time acclimating the new arrival. Chances are that the pH of the tank water where you are buying your livestock is a lot different than that of your newly set up tank. If you have tank lighting which will support corals, you can also add a coral or two to your tank at this time. There are 15 easy corals for a reef tank that are fairly easy to maintain and are more forgiving of less-than-perfect water quality and somewhat lower lighting. As time goes on, you can slowly add more fish, corals, and other invertebrates based on the size of your tank and your live inhabitant's tank size requirements. Generally speaking, corals and most invertebrates, like hermit crabs or snails, do not add much of a bioload to an aquarium, however fish, even small ones, can add dramatically to the amount of ammonia that a new biological filter will be called upon to process. If you plan to ramp up the size of your fish community, you should make sure it is ready for it. Do the following if you plan to bring in more fish and livestock.